From the 16th to 19th July 2020 Royal St George's, which is considered by many to be one of the finest golf courses in the world, will be hosting the 149th Open Championship. Set in the stunning Kent countryside, players and spectators will enjoy unrivalled views of the sea and the surrounding scenery. We are now taking bookings at our properties located in Sandwich and the surrounding 20 miles, all of which are featured below. Don't miss out on the perfect accommodation for the event and get in touch with our friendly team by phone on 01580 720770 or email to book today! Please note that bookings cannot be made online. Specific booking terms and conditions apply. Please view here before booking. This superb second floor apartment (with lift) is within excellent proximity of the local amenities Walmer and Deal have to offer. It is also very close to Deal station which has a regular train service to London, Dover, Ramsgate and Sandwich. A beautifully presented 16th Century house located just outside the city walls and almost within sight of the cathedral spires. This sympathetically renovated cottage enjoys beautiful views across rolling hills and parkland and is just a 30 minute drive from The Open. The historic city of Canterbury is nearby too! Exceptionally decorated with antique furniture, vintage radiators and a butler sink this is an exclusive property close to local amenities. Tucked away in a quiet spot, just a stone's throw from the beach is this comfortable cottage. Surrounded by golf clubs, this is a great choice for any golf lover! This welcoming cottage has lots of touches to make your stay extra special. Enjoy the pretty garden with games for all the family or just take a few steps onto the beach! Located just 15 minutes away from the exciting city of Canterbury, this former stables provides comfortable accommodation for a small family. Enjoy great views across the meadow from its pretty garden. Located in the quaint winding streets of Deal, just minutes from the beach, is this beautifully charming cottage. Deal and Walmer castles are nearby for a fun family day out. Nelson Cottage has been beautifully renovated to provide an exceptionally comfortable and attractive holiday home in the heart of the conservation area of Deal. A period mid terrace property full of character, ideally placed for all amenities, located in the beautiful seaside town of Deal. Kingfisher Cottage is located just a stone's throw from the beach, in the beautiful village of Kingsdown, close to the popular seaside town of Deal which still boasts a strong fishing community. Hazel Barn can be found next door to its sister barn, Apple. Hazel is an eco-friendly barn conversion, finished to a very high and comfortable standard. It is tucked away in an enviable position, in an area of Outstanding Natural Beauty on the Kent Downs, surrounded by walks, wildlife and birds. This characterful cottage, located in the heart of town and just 10 minutes walk from the beach, has everything you'd need right on your doorstep. Aynsley Court is on the first and second floor of an attractive mews style group of apartments in a quiet spot in beautiful Sandwich - a medieval cinque port town with many interesting ancient buildings - with private parking. Apple Barn is the sister barn to Hazel and can accommodate five people. Apple is an eco-friendly barn conversion and is furnished and finished to a very high standard. It is tucked away in an enviable position, in an area of Outstanding Natural beauty on the Kent Downs, surrounded by walks, wildlife and birds. Situated next to the River Stour in Sandwich, the property is ideally located within a short stroll to all the local restaurants, pubs and shops. A modern home set over three floors with private parking. This attractively furnished, spacious townhouse is perfectly located overlooking the beautiful river Stour and is just a stone's throw from the heart of medieval Sandwich. This welcoming family home is located just minutes from the sandy beaches of Viking Bay and boasts impressive sea views from the top floor. Royal St George's is just 30 minutes away. This is the perfect family chalet - located on a 6 acre holiday park. The Open is just 20 minutes away and the old fishing towns of Deal and Walmer, with their castles, are on your doorstep! Just a few yards from the clifftop overlooking Ramsgate Marina is this characterful townhouse. The white sands of Ramsgate beach are just a few minute's walk away making this the perfect family holiday home. The property has some lovely original features with large sash windows and internal shutters. With the pebble beach almost on your doorstep you can stroll along the pedestrian seafront taking in the views of France on a clear day. This open plan property is spacious with the most spectacular views. The owners, who live on the farm, are renowned for their award winning breakfasts and are only too happy to cook one up for you, using their own fresh eggs and seasonal produce. This bright, spacious property is conveniently located for the shops and restaurants of Sandwich as well as access to the royal St. George Golf Course which is an easy walk or cycle away. Conveniently located, with all the amenities that beautiful Sandwich has to offer, this modern property with Juliet balconies, looks out onto the river. It has direct access onto the riverside walk and the Royal St George is less than a mile and a half walk away making this an ideal base for your stay. This modern house has been finished to a high standard and is just yards away from the beautiful sandy beach. The Open can be easily reached by car in 25 minutes. A stunning very spacious seafront property with fabulous sea views furnished and equipped to a very high standard with modern luxuries aplenty. This spacious and stylish property combines beautiful character with all the luxury of modern living. Situated in secluded grounds which are large enough to land a helicopter, with the appropriate permissions, it has easy access to the main road and Sandwich. 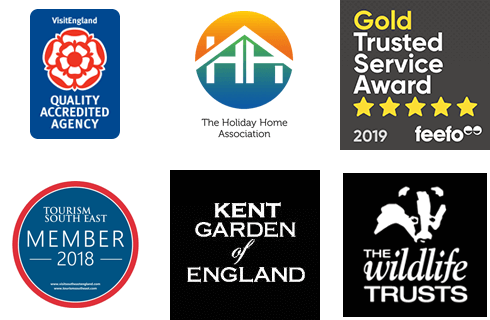 Reservations of all holiday accommodation whether made by telephone, in person, in writing or from the internet are accepted by Kent and Sussex Holiday Cottages, hereinafter referred to as KSHC, on the following conditions. 1. CONTRACT OF HIRE - The hiring contract will be between you the Hirer and the Owner of the property for which the booking is made and shall be deemed to be made subject to these Conditions of Hire and governed by English Law. KSHC act as Agents for owners, and are not Principals. The Contract of Hire is not effective until KSHC despatch to the Hirer written confirmation of the booking. The contract is for the hire of the property for holiday purposes only. We do not accept bookings from Hirers under 18 years of age. 2. INITIAL PAYMENT - Bookings will be confirmed upon receipt by KSHC of the required NON-REFUNDABLE deposit payment of one third of the total holiday cost, comprising cottage rental, booking fee and any additional charges – e.g. pets. If the booking is made within eight weeks of the holiday commencement date, the full accommodation rental will be required at the time of booking. Deposits can be paid by card or cheque, or in the case of web bookings, paid online through our secure payment system. 3. BALANCE PAYMENT - The Balance of the Hire will be due BY 1ST JANUARY 2020. On receipt of the Balance Payment, advice of key collection arrangements and directions to the property will be sent to the Hirer. The Owner/KSHC reserves the right to cancel a holiday where full payment has not been received BY 1ST JANUARY 2020. The deposit paid on the booking is non-returnable. 4. METHOD OF PAYMENT - Cheques should be made payable to Kent and Sussex Holiday Cottages. There is no charge for Debit/Credit Card payments. 5. VALUE ADDED TAX - Where VAT applies to the property rental, it is included in the quoted price at the prevailing rate. KSHC’s Confirmation of Booking is not a VAT invoice. All KSHC charges and VAT inclusive rentals include VAT at the prevailing rate and are subject to change if the rate changes. 6. CONFIRMATION OF BOOKING - Once KSHC has issued a Confirmation of Booking, the Hirer is responsible for the total published price of the property and extras as shown on the confirmation. Amendments to bookings, where applicable, will be subject to an administration fee of £50. The Agents reserve the right to adjust prices quoted in the brochure, on our website or on details to properties, due to errors or omissions or changes in VAT. 8. BOOKING FEE - KSHC charges a booking fee of £35 for your booking payable at the time of booking. 9. AMENITIES - The use of accommodation and amenities, where offered, such as swimming pools, rowing boats, beach huts etc., is entirely at the users’ risk, and no responsibility can be accepted for injury, or loss or damage to users’ or visitors’ belongings. However, KSHC do not seek to exclude or limit legal liability for the negligence of their servants or agents. 10. PARTY NUMBERS - In no circumstances may more than the maximum number of persons as stated in the brochure or website occupy a property. Owners reserve the right to refuse admittance if this condition is not observed. Only those listed on the booking may occupy the premises. The person who completes the booking, i.e. the lead name, certifies that he or she is authorised to agree to the Booking Conditions on behalf of all members of the party, including any changes. The lead name must be over 18 years and a member of the party occupying the property. The lead name agrees to take responsibility for all members of the party. The Owner/KSHC reserve the right to refuse or revoke any bookings from parties that may in their opinion (and at their sole discretion) be unsuitable for the property concerned. 11. YOUR RESPONSIBILITIES - For the whole of the period included within your booking, you will be responsible for the property and will be expected to take all reasonable care of it. The property details aim to give accurate descriptions of the properties. Should there be any specific health or mobility difficulties which may affect a party member; this must be pointed out at the initial reservation stage so that the suitability of the property can be assessed. The property and all equipment and utensils must be left clean and tidy at the end of the hire period. At no time should a pet be left alone unsupervised at the property. The property must be vacated by 10.00am on the day of departure. 13. DAMAGE - All damages and breakages are the legal responsibility of you, the Hirer, and should be notified to the Owner or keyholder before the end of your holiday. The cost of damage or breakages shall be payable on demand. Normally, minor damage or breakages will not be charged but in circumstances where extra cleaning is required or there has been breakage or damage beyond what is reasonably to be expected, the Owner/KSHC reserve the right to charge you for any additional costs incurred as a consequence and may, at their discretion, refuse further bookings. Should you find on arrival any damaged or non-working items, they must be reported to the Owner or keyholder immediately, so that matters can be rectified. The Owner/KSHC has the right to enter the property (without prior notice if this is not practical or possible) if special circumstances or emergencies arise (for example if repairs need to be carried out). Any Damages/Security Deposits charged by the Owner and administered by the Owner themselves or by KSHC will be cashed on receipt to allow for bank clearance and reimbursed promptly after the holiday (less any penalties which may be incurred). KSHC reserves the right to request payment of a security deposit should it be deemed necessary by the Owner. The Owner/KSHC reserves the right to repossess the Holiday Home at any time, where you or any member of your party has caused damage. The Owner/KSHC shall not be liable to make a refund of any remaining portion of the hire terms paid. 14. COMPLAINT PROCEDURE - If you are dissatisfied with the service you receive, the Owner or keyholder must be notified immediately, so that investigation can be carried out and any necessary action taken. All complaints must be notified to the Agents immediately so that they can investigate the circumstances, and take any necessary action. In no circumstances can compensation be made for any complaints that are made after the hire has ended, or where the Hirer has denied the Agents or the Owners the opportunity to try to put matters right during the Hirer´s stay. 15. LITERATURE - KSHC takes every care to ensure the accuracy of the property descriptions. All information in this brochure and on our website is given in good faith and is believed to be correct at the time of going to press, but KSHC cannot be held responsible for changes beyond their control, which may become known after publication of this literature. In addition, whilst we describe properties as non-smoking or no pets, this cannot be guaranteed. The description of a cottage shows what amenities that property has but generally does not state what is not in the property. Please be aware that if a property is advertised as having an enclosed garden, this does not necessarily mean a secure garden. It may be enclosed by hedging or open style fencing. Further, KSHC cannot accept liability for happenings outside their reasonable control, such as breakdown of domestic appliances, plumbing, wiring, temporary invasion of pests, damage resulting from exceptional weather conditions or the Owner’s negligence resulting in loss, injury or accident. 16. LEGAL - In the event of any dispute between parties it shall be governed by the jurisdiction of the English courts only and any actions shall be heard in the court for the area in which the property is located unless otherwise agreed between the parties. However, it is hereby agreed and declared that all reasonable endeavours will be used to resolve the dispute arising between you and the Owner and/or KSHC without immediate recourse to litigation. If not mutually resolved, it is further agreed that all reasonable endeavours will be used to resolve the dispute by a formally recognised alternative dispute resolution process i.e. mediation, arbitration or expert determination. In default of such agreement, the process and appointment of the independent professional will be determined by the President for the time being of the Law Society or the Chartered Institute of Arbitrators. In either case, all parties will contribute equally to the expense of such process, and, in default these expenses shall be capable of being recovered in any subsequent litigation. 17. AVAILABILITY - The Hiring Contract is made on the understanding that the property and its facilities as published will be available for the dates stated. In the unlikely event that a property is not available through events arising outside the control of the Owner/KSHC, then the Owner/KSHC may be forced to cancel the booking. The Hirer will be advised as early as possible. Where possible, the Hirer will be offered suitable alternative accommodation, which, if not acceptable, will entitle the Hirer to a refund of all monies due. The Hirer will not as a result have any further claims against KSHC or the Owner. Please note that reservation requests taken via our website are not confirmed bookings until we have contacted you and accepted a payment. These Booking Conditions apply to bookings for the Open Golf 2020 only.